Lyme disease is a misunderstood illness. Millions are suffering world wide with an infection that went ‘under the radar’ for the past 40 years and has wreaked serious damage and deaths in too many awful instances. Initially thought to be a short term limited infectious illness, by the CDC and IDSA, back in the 1970s and 1980s, with approximately 2 weeks of bodily flu-like pains, headache, fatigue and a frank red ‘bulls eye’ rash, we have learned the HARD way through several generations of suffering and brilliant clinical doctors, that his spirochete organism augers its way from bloodstream into the bodily tissues, joints, organs, glands and spinal fluid and brain- like its similar cousin, syphilis! The blood tests relied upon were designed originally for epidemilogical screening, but became the prime tool doctors turned to when a suspect patient arrived in their office with flu feelings and odd other complaints. That ELISA antibody test so regularly used, has a 70% false negative result– only accurate in a small window of approx 2-6 weeks of an early infection. Many of us are tested earlier or later and show a false negative. IF the Western Blot test gets used, those that test positive ARE infected with Lyme (and maybe more tick borne infections?) but docs look to VERY dated CDC criterion that insist you must show 5 bands out of several dozen for confirmation of infection. This is NOT GOOD!!! One band alone can confirm a pos Lyme infection according to the Lyme disease experts of the world. MILLIONS of cases are being missed and then end up often doctor-hopping, eventually ‘morphing’ into autoimmune illnesses when the infection has gone from a blood illness to a tissue disease !! The CFS, MS, RA, Fibro and more could have STRONG cross-over influences from Lyme disease organisms!! Which means you and actually heal and not be medication dependent forever. Not bedridden anymore! Modern medicine, the government, all the outdoor organizations (boy/girl scouts, camps of America, hunters, loggers, farmers, hikers, campers, gardening clubs< etc) every single doctor and citizen needs to be educated on ticks, Lyme signs and symptoms, prevention, proper diagnostics and treatments with Integrative Medicine!! Of dire importance is that we raise awareness and funds for research. The TICKED OFF MUSIC FEST series is a stunning, fun, informative, healing and totally dynamic movement that unites all these ingredients. I LOVE BEING PART OF TOMF!! Every event I have participated in is so fulfilling, rich with talent and heart, lifted up with great world class music and inspiration and brings cutting edge speakers to the big stage. It is a feel good day with great philanthropic energy. 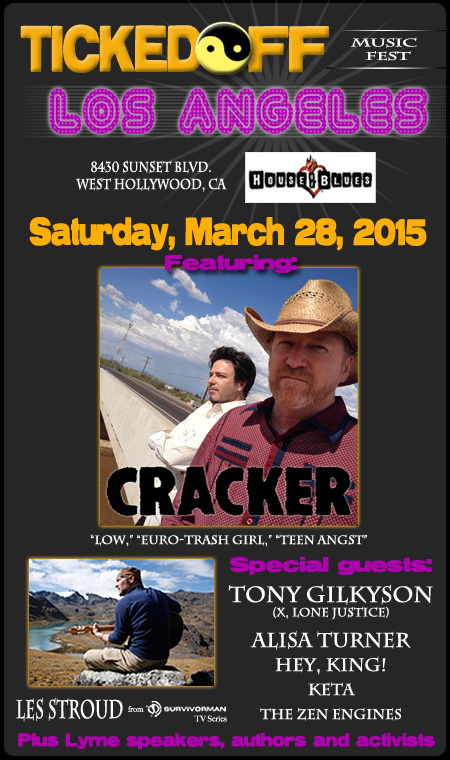 TICKED OFF LA IS BRINGING THE LYME DISEASE CRISIS TO THE NATIONAL MAINSTREAM LEVEL IN AN ICONIC VENUE! House of Blues LA is famous and an important for the Lyme movement. The way AIDS needed Hollywood celebrity to make it REAL and not just a ‘gay mans’ disease, our HOUSE OF BLUES LA event puts Lyme disease in the spotlight it deserves. Too many people- the average you, the famous movie stars, the ex-president George W. Bush, your child, me, a neighbor have all been afflicted. Some of us heal fully, others suffer for ages. Let us stop the suffering!! Let us get the money to fund the researchers, to support patients whom have gone bankrupt from treatments, to help Mara Williams build a residential treatment center Inanna House, to assist the LymeLightFoundation aid childrens medical bills and LymeDisease.org keep their grassroots support group network alive. I PROMISE YOU— AND I HAVE GOOD INTUITION! Ticked Off LA is going to be a game changer in the Lyme story— come one board with us now! and chip in to the IndieGogo. One droplet of rain doesnt feel like much, a million droplets generates a flood! 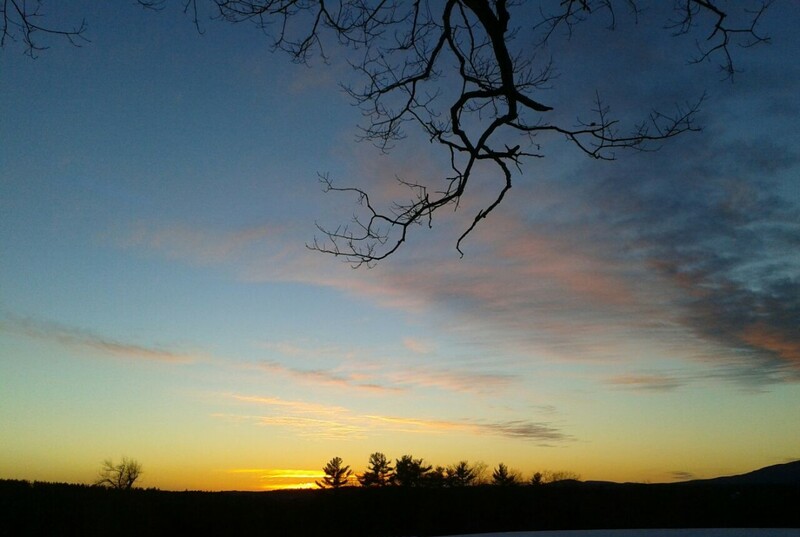 Though the snows still blanket the land, the air is warming and the sun soothing to a softer hue. How happily we New Englanders welcome the thaw of early spring, the sap running in the maples and the sweet smoke of sugaring shacks at work! We also now perk up the antennae to tick season around the bend. The tiny insects, in the spider family actually, harbor the atrocious bacterial infection of Lyme disease and other illness inducing organisms. What is tricky too is that the baby tick nymphs hatching out now in late March and April are very tiny and translucent. Their outer shell is still forming yet they can carry the diseases. We must all be alert as we rake out flower beds, clean up wood piles and winter blow-downs, and our pets and live stock take to the fields, woods and yards. 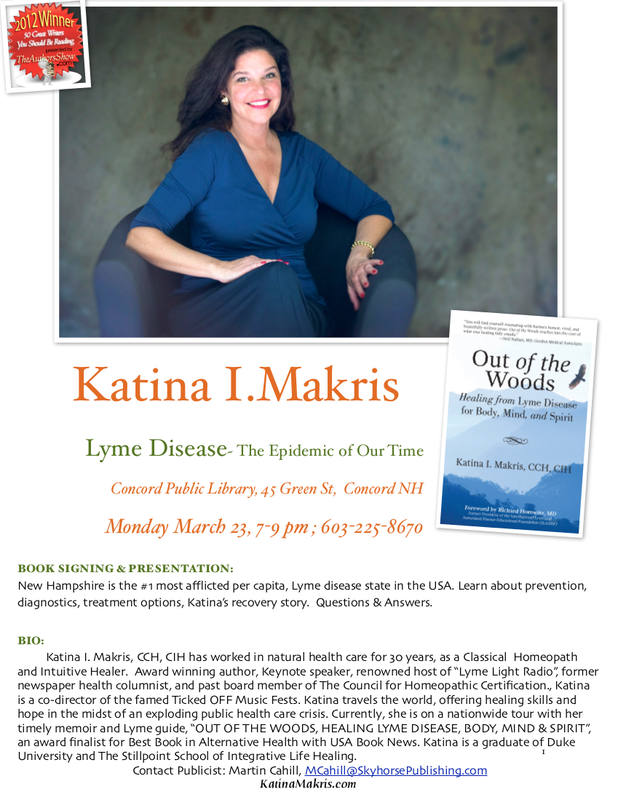 Katina I. Makris,renowned Homeopath and educator,who specializes in Lyme disease, welcomes all to the Concord Library at 45 Green St, Concord, NH Monday March 23, 7pm. She covers a great deal of information as well as introduces her award winning Lyme recovery memoir and healing guide OUT OF THE WOODS, HEALING LYME DISEASE, BODY, MIND & SPIRIT, released by Helios Press, in a new second edition. With tick season in motion, come join us for a great evening, as Katina heads out on her nationwide book tour, and as Keynote Speaker at the famed TickedOffMusicFest.com series– fundraising and Lyme awareness at big city venues, that bring healing, help and music together for the good of an exploding public health crisis. This week on Lyme Light Radio I am proud to welcome holistic MD Sunjya K. Schweig. Dr. Schweig and his colleague Chris Kresser, LAc. are the co-founders of a new project, the California Center for Functional Medicine (CCFM). He will share the ways in which environment, lifestyle, and genetics can all interact to contribute to a person’s health or illness. You can tune in to my interview with Dr. Schweig this Wednesday, March 3 at 4PM ET/1PM PT at http://www.transformationtalkradio.com or WBLQ AM 1230 in Rhode Island. Sunjya K. Schweig, MD is an expert in complex chronic illnesses which require rigorous investigation and management. 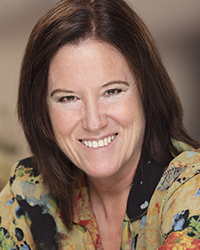 Dr. Schweig utilizes cutting edge diagnostic and treatment modalities that respect the complex interconnectedness of the body and the environment.